I sat on the floor the other night, in a quest to organize, photo albums around me. Pictures, cards, and notes from times gone by. The days before I was married and had children, when I was just becoming a teacher and a grown up. Then pictures of my wedding and pictures of my children as babies. How those days have flown! My children are both in elementary school now and those gummy toothless smiles, feety pajama days didn't last nearly as long as I thought they would. I have a feeling that time is flying by me. Days go fast and are filled from the moment I wake up until the moment I can't keep my eyes open any longer. 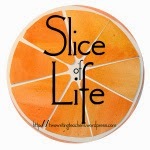 There is a feeling of never being caught up, never doing enough, rushing, rushing, rushing. Too busy to reach out to a friend. Too busy to chat with my mom. Too busy to play a board game with my son or cuddle on the couch with my daughter. "The way we spend our time defines who are," Jonathan Estrin once said. And Jim Rohn said, "Either you run the day or the day runs you." I'm kind of over the day running me. 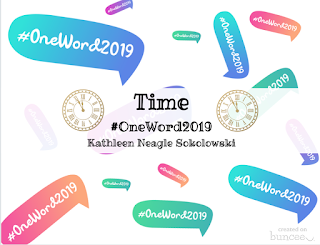 This new year, 2019, my #onelittleword is TIME. I want to take time to appreciate all the beauty in my life. I want to give my time and attention to those I love without thinking of all the other things I should be doing. I want my time in the classroom to be joyful and intentional and purposeful. I want to make time for my goals, my health, my dreams. As I approach a new decade in my life, I want to enter into it as my best possible self. 2019 is my TIME to be the best version of myself and to be grateful for each day. What word will guide you this year? This is fantastic! Taking time is always a good idea. More time for ourselves usually means better time with others. As always I wish we could be next door teacher neighbors. Wishing you the best in the new year. We have to budget our time as professionals and moms, don't we? Like you, I'm trying to turn off my screens (TV and computer) for the frivilous stuff so I can find more time to read. Speaking of which, I started a fabulous new book, The Alice Network, a couple of nights ago! So easy to let time pass. Thanks for the reminder to be more intentional. I love the resolution to read more books and limit scrolling time! I need this too! Love TIME! I love what it means to you in your life right now! It's so cool how that having chosen a word, we can (at least try) to live a more wide awake life in tune with the word we have chosen! All the best to you and TIME! Thanks for sharing! Time was a contender for me as well--love that word! I am sure you will think about it throughout the year!